This contest started on 1/17/19. This contest has a winner. * Win A $20 Bagel City South Gift Card. Jeff Eats got a $20 Bagel City Gift Card to give to one of you guys! The $20 Gift Card is good at Bagel City South, 6006 Southwest 18th Street, Boca Raton, Florida 33433, (561) 393-5383. 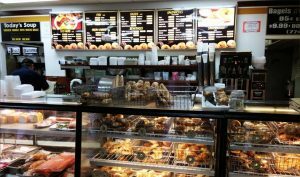 You can check menu/prices/info at bagelcitysouthbocaraton.com. ***** Bagel City South, 6006 Southwest 18th Street, Boca Raton, Florida 33433, (561) 393-5383. I know you don’t like or really do ‘best’ lists. Indulge me, if it came down to just one south Florida joint, which one would it be for bagels? You know that ‘best’ lists really aren’t my game…that said, if you promise not to tell anyone! 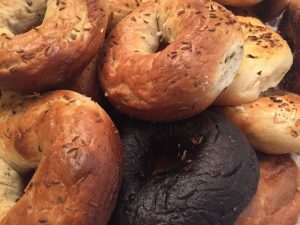 Bagel City South makes some of the best New York styled bagels and bialys in South Florida. The stuff is made the old fashioned way, that being hand rolled, boiled and then oven baked. The joint is open 7 days a week for breakfast and lunch. Great place for appetizing, burgers, deli, eggs and of course those fantastic bagels/bialys. Sassy waitresses and talkative countermen add to the New York flavor. This is a real good one. During my 31 years in Florida Ive eaten a ton of bagels here. Bagel City south definitely has the real deal NY Bagels. Would like to try their bagels. I’d love to be chosen! They make the best bagels. I am headed there this morning….